Blend in SGS’s crews try not to draw attention to themselves, seeking instead to take a quiet approach. Behind the bright flowers and exotic plants that adorn some of Hawaii’s most elegant resorts, you’ll find Sidney Sparkman and his crews. Their simple green shirts don’t bear the company name, only the logo, a honu, which is Hawaiian for sea turtle. Their battery-powered equipment barely makes a sound, allowing guests to enjoy the grounds undisturbed. They don’t have business cards, flyers or even a website to promote themselves. In fact, if not for the stunning landscapes and pristine turf, you might not even know they were there—a fact Sparkman never intends to change. Sparkman says SGS Hawaii is one of the largest landscaping companies in the state of Hawaii, but few people know of the company. SGS Hawaii has a staff of more than 100 employees and serves 20 clients, including 14 resorts, two resort subdivisions, two shopping centers and a few high-end residences on the islands of Maui and Kauai. In addition to knowing how to deliver beautiful, sustainable landscapes, Sparkman knows who he is and what he stands for and runs his business with a simple, straightforward approach. Sparkman has always had a passion for landscape work. He recalls a memory of running away from home when he was 5 years old and his mother finding him cleaning up a neighbor’s lawn for money. Sparkman studied geology in college but was quickly drawn back to outdoor work. He and his wife, Alysha, moved from Texas to Hawaii in 1993, and Sparkman found work as the assistant director of landscaping at the Hyatt Regency Maui Resort & Spa in Kaanapali. The following year, he became director of landscaping and water features at the Grand Wailea Resort & Spa in Wailea. As a way to make extra money, the couple started their own landscape operation in 1995 with a single account that paid $75 per month. Today, SGS Hawaii provides 90 percent maintenance and 10 percent installations to mostly commercial clients. 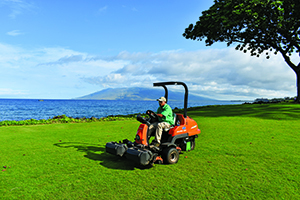 Lay low SGS Hawaii’s use of battery-powered equipment ensures peaceful experiences for resort guests. Sparkman says his company is unique because many resorts throughout Hawaii have in-house landscaping crews, similar to the one he managed at the Grand Wailea. But Sparkman was in the right place at the right time when many new hotel and resort properties were being built that didn’t have their own landscaping teams. He says the hotel industry is a “tightknit group of people” and word-of-mouth referrals led him to opportunities to meet the landscaping needs of these new developments. 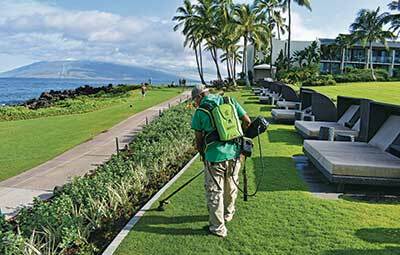 Sparkman’s focus on environmental sustainability began during his time at the Grand Wailea, where he first experimented with practices like integrated pest management (IPM), composting and other forms of natural pest and weed control. That focus carried over to SGS Hawaii. In 2012, Sparkman decided to work toward no- to low-noise and zero-emissions concepts with the company’s lawn equipment. Working with a local dealer, his crews tried battery-powered trimmers and blowers, and Sparkman says “they were hooked.” As technology has improved, the company now performs 90 percent of its lawn maintenance with battery-powered equipment, as well as various rotary and reel mowers on smaller lawns. While the equipment is expensive—he has four battery-powered Jacobsen Eclipse mowers that cost $43,000 each to manage the seashore paspalum turf—Sparkman says he attracts more exclusive clientele because he can provide a better experience for the resort industry. He adds there are other opportunities for battery-powered equipment he has yet to explore, such as hospitals, schools and other places where noise and gas emissions are problematic. Hawaii’s tropical climate is a breeding ground for insects and diseases, which Sparkman continues to manage with IPM. He has educated his clients that the presence of some weeds and insects is a good thing and that a sterile environment is not necessarily a healthy one. The company is judicious about the lawn chemicals it uses, only spot treating problems as necessary. Sparkman incorporates compost and humic acid as part of his management practices as well. While he still uses synthetic fertilizers, his goal is to be 100 percent natural by 2020. Sparkman says he wouldn’t be able to “do what is right” without the help of his staff and leadership team. Many of the company’s staff are immigrants from the Philippines and Micronesia who came to Hawaii on visas to work on sugar cane and pineapple farms—industries that have since disappeared from the state. Sparkman empowers his leadership team to research and experiment to ensure the company is pushing the envelope in terms of sustainability, IPM, water management, safety and efficiency standards. So far, Sparkman’s unconventional approach to running his landscape business has proven successful. SGS Hawaii has experienced more than 20 percent annual growth for the past decade, but Sparkman says it’s time to slow things down a bit and hold steady for the next year or so. One reason, he says, is it’s hard to find employees, as unemployment has “flatlined” in Hawaii. He also says it’s time to revamp the company’s internal systems, including human resources, hiring practices, safety programs and more to prepare SGS Hawaii for future growth. Sparkman is currently talking with a national organization that helps landscape companies improve business performance and other green industry experts for ideas on how to move forward. “We have had hotel general managers contact us to come look at their properties, but I’ve told them I’m not ready yet,” Sparkman says. “We first need to look at our internal systems that need to be improved upon or completely overhauled in order to better position us for the next growth spurt. Emily Schappacher is a freelance writer based in Cleveland.